60 cm/24" is this good bisque doll on Jointed bisque body from Simon og Halbig/ Heinrich Handwerk, Germany.Brown eyes, open mouth with 4 teeth.On wooden jointed body.Bisque in fine condition. She is dressed in herantique white dress. The body is in excellent condition. Antique 19" / 50 cm Heubach Laughing Character 5636 with brown Sleep Eyes Sunburst Mark Beautiful character 5636 Mold with Impressed Heubach Mark on back of head. Made in Germany for Heubach Circa 1910, Head has impressed star burst mark. Wonderful happy Smiling Open/Closed mouth with molded tongue and those wonderful two lower white teeth. Brown glass sleep eyes, all around painted lashes, finely feathered brows. 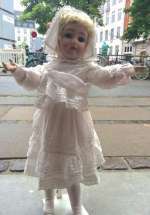 Nice correct German Toddler ball jointed body - Nice Rosy cheeks & facial coloring. Blond original mohair wig. No damage or repair to bisque head. Dressed in antique knitted dress with socks. Seldom seen character mold from Gebruder Heubach. Size: 19" / 50 cm. Excellent condition. 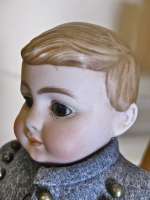 Old bisque head boy character doll made by Kestner ca 1900. This is a lovely boy with large brow paperweight eyes and closed mouth. He is dressed in a fine boy outfit made of wool. He is on his original composition body with painted shoes. The bisque is flawless. He is 42 cm tall. This unusually large charming Googly doll in her old dress is difficult to resist! A fine example of Armand Marseille’s precious Googlie #323 from circa 1910. This lovely girl is in very excellent condition with perfect bisque head, no damage and no repair, and is marked: “Germany // 323. // A. 3 M.”.She has big blue Googly glass sleep eyes, surrounded by finest painted lashes, sweet rosy cheeks, dimpled double chin and smiling mouth. She has her original mohair wig. The old composition body has the original paint and is in good condition with only minor surface wear to toes at one foot., jointed at neck, shoulders and hips.She is wearing her all original antique dress! This charming girl is ca 11" tall ( 31 cm) Excellent condition. Armand Marseille Oriental 'Ellar' Bisque Socket Head Doll, with sleeping brown eyes, closed mouth on a bent limb composition body, wearing later costume, 30cm / 12 " Broad nose, small dark eyes, flawless bisque.closed mouth. The baby is on the original composition baby body with original finish. No line-no cracks to bisque. One finger missing. She is in a fine size for displaying in a cabinet Made in Germany..A special baby for the collector of good baby dolls.. Ca 1910. Lovely bisque head doll for the French market. What a great find. These two sister from the Kling Compagny in Germany are in unplayed mint condition wearing their Swedish all original antique outfits. 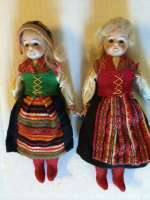 Each has blond mohair wig and lovely facial features. Inset eyes. The head is bisque in a great quality and so are the arms. The body is fabric. Both wearing their Swedish original costume. Each 8" tall - 20 cm. Ca 1890 from Kling, Germany. Mint condition. All original all over! NOTE: THE PRICE IS FOR EACH DOLL. 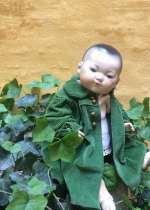 Armand Marseille Oriental ''Ellar'' Bisque Socket Head Doll, with sleeping brown eyes, closed mouth on a bent limb composition body, wearing antique boys dress with jacket. 30cm / 12 " Broad nose, small dark eyes, flawless bisque.closed mouth. The baby is on the original composition baby body with original finish. No line-no cracks to bisque. She is in a fine size for displaying in a cabinet Made in Germany..A special baby for the collector of good baby dolls.. Ca 1910. Size 38 cm /15"